Demographics in the U.S. are changing. Today, most first-generation college students, or those with parents that haven’t earned Bachelor’s degrees, are Hispanic students. Yet, few research studies exist that focus on this group of underserved students. 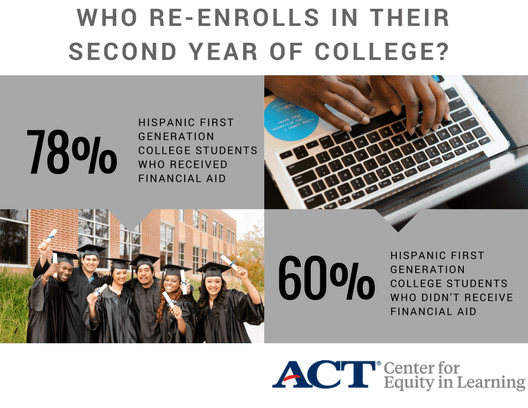 To gain more insights, ACT Research conducted a study to better understand how we can support the success of first-generation Hispanic students. Using a cohort of students from a Hispanic-serving institution in the southwest, we examined the effects of accelerated learning (when high school students take classes for college credit) and financial aid (money given to college students based on need) on academic outcomes. We found very promising results. First, we found that first-generation Hispanic students who participated in accelerated learning in high school were more likely to earn higher grade point averages (GPAs) during their freshman year in college compared to first-generation Hispanic students who did not participate in such learning (2.64 vs. 2.37). 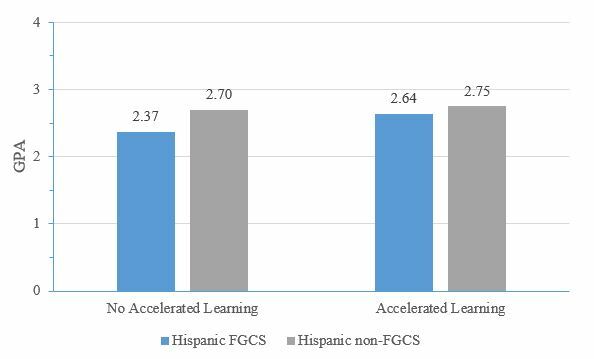 First-generation Hispanic students who participated in accelerated learning also had very similar GPAs compared to Hispanic students who were not first-generation students (2.64 vs. 2.75). 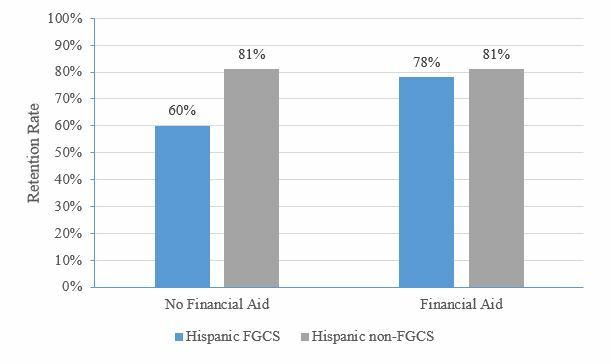 We also found that first-generation Hispanic students who received financial aid were more likely to enroll in their second year of college, compared to first-generation Hispanic students who didn’t receive financial aid (78 percent vs. 60 percent). Further, first-generation Hispanic students who received financial aid were nearly as likely to enroll in their second year of college as Hispanic students who were not first-generation students—leveling the achievement gap. First-generation Hispanic students who received financial aid were also more likely to earn enough credits in their freshman year of college to be on-track to graduate within five years—a promising outcome, especially with the skyrocketing costs of college and student loan debt. Based on these encouraging findings, administrators, teachers, and policymakers, should promote and encourage first-generation Hispanic students to participate in accelerated learning programs such as dual-enrollment. These programs can help students become familiar with the academic rigor of college courses, while benefiting from the structure and support of a high school environment. Additionally, education leaders, advocates, practitioners, and organizations should continue to promote financial aid programs and encourage students to apply annually for financial aid in the form of scholarships and/or federal financial aid beginning October 1 of their senior year in high school (see FAFSA website). While it is important for students to be well-informed consumers as to the amount and type of debt they are incurring, applying for FAFSA is free and having access to financial aid can free students from having to work too many hours in college. More details about this study can be found here.